1 chocolate brownie mix – I used the Donna Hay packet mix that we cooked a while back. Lets face it, we are all short on time at this time of the year so why make things more difficult than you have to?? Cut the strawberries in half. Here is where I ran into my first problem. My strawberries were too big to sit on top of the brownie so I had to make them smaller (Thomas enjoyed eating the offcuts!). Drain the strawberries on some paper towel while you mix up the cream. This was another problem I found. If you don’t do this, your strawberries will run into the cream and slide off! Whip the cream and icing sugar together. Add as much icing sugar as necessary to make the cream hold its shape. Pipe some cream onto each brownie. Place a strawberry on top of the cream and then pipe a little dot of cream on top of the strawberry. Voile! 2. Drain the strawberries on paper towel to avoid them running into the cream and from sliding off. 3. Add icing sugar to cream so it will hold it’s shape and the strawberries will stay in place. 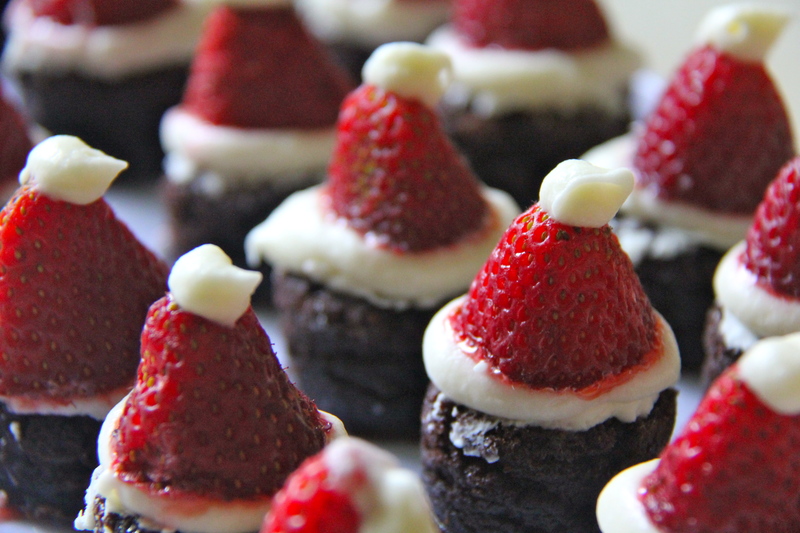 You can see from the picture that my little Santa hats are not perfect but they still tasted yummy and it was fun – even with all the frustrations!